Physical Activity Monitoring – A person needs to perform daily physical activity to stay healthy and fit. Daily physical activity (PA) can be defined as the body movement produced by skeletal muscles and resulting in energy expenditure. It has an impact in various ways. The global health condition of a person since several diseases’ incidence are higher with a PA lower than the recommendation values: hypertension, diabetes, obesity. Physical activity also improves the mood and well-being. Even though we do know the importance of physical activity, we tend to be not motivated due to various reason. One such reason is the lack of information of how much effort we are putting. The way to quantify it is through providing data such as number of steps, calories burnt, and distance travelled. Sleep Monitoring – Sleep occupies one-third of our life and plays an important role in overall health by recovering physical and mental functions, so it is crucial to have sound sleep. Many of us sometimes feel tired all day long due to overworking on previous day or symptom of flu. Continued lack of sleep causes health problems, and sometimes sleep shortage is caused by sleep disorders. The common sleep disorders include sleep apnea, narcolepsy, restless legs and insomnia. The emergent importance of the sleep medicine together with the rapid adoption of mobile devices and wearables along with a growing habit for using these devices on the daily-living activities offer an opportunity to use them as a sleep monitor. Traditional sleep monitoring systems, such as polysomnography, involves a myriad of sensors attached around the patients’ body, and therefore is limited to clinical usage. In line with this, alternative solutions have been widely investigated focused both to infer sleep information based on a reduced number of sensors, and to use non-invasive and feasible technologies. Posture Monitoring – Most of modern people spend on most of their time sitting at a desk, typically working on a computer. One of the most recent forecasts of computer adoption estimates that there were more than a billion computers in use at the end of 2008. This report also forecasts a 12.3% compound annual growth rate between 2003 and 2015. Driven by lower prices and global demand especially in developing countries it is expected that there will be over 2 billion computer users by 2015. A study of 512 office workers found the 12-month prevalence of neck pain to be 45.5%. Reports of the lifetime prevalence of neck pain in the general population range from 67-80%. As computer adoption increases, we can expect a corresponding increase in the prevalence of neck pain if appropriate countermeasures are not employed. Over time poor posture results in pain, muscle aches, tension and headache and can lead to long term complications such as osteoarthritis. Physiological and biomechanical stress due to sustained postures limit important musculoskeletal stimuli that are essential for normal musculoskeletal development. Most upper extremity disorders and symptoms (neck, shoulder, elbow and wrist pain) are associated with computer use at workstations in positions of poor posture. Upright sitting posture is the best way to prevent such disorders. Upright sitting posture doesn’t lean the centre of gravity to one side. The body is observed to the sagittal plane, frontal plane and horizontal plane. The system for maintaining correct posture of the user has been developed in order to prevent for poor posture. But the system utilizes camera feed thereby making it inefficient in terms of cost and space limitation. In such a scenario, the use of accelerometer sensor will be more useful, and the desired outcome can be attained. The main contribution of the proposed project is to define and implement a system architecture that will be able to solve the above issues along with providing additional supplementary features. The proposed project – SuperWear – is a one of a kind and seamless approach that enables the common individual to utilize the smart technology for their healthcare and daily lifestyle activities. It follows an integrated and hybrid approach, complementing on the traditional methodologies to allow an individual to progress and realize their potentials and stay healthy and informed on-the-go. The design of the proposed project is such that it does not hamper the natural process while still being able to capture the data necessary to generate an actionable feedback and outcome. Enable technology in the sectors of healthcare, fitness and daily wellbeing to improve the lifestyle of an individual. Encourage daily physical activities by providing them the information related to their effort so that they decide their goals and make informed data-driven decisions. Reduce the complications faced by individuals who suffer from back and neck pain due to prolong sitting on the desk by providing them instant feedback related to their posture so that over time their habits will improve, thereby they do not suffer from complications in the long run. Monitor the sleeping habits of an individual to give them insights about both the quantity and the quality of sleep so that they can decide on an optimum routine. Focus on the masses thereby create an approach where the technology seamlessly integrates with the daily life of an individual rather than disturbing it. The proposed project is the first step towards creating a Smart Individual allowing for every citizen to have the right to good fitness, good health and good sleep. It is the necessary step for opening a completely new era where the transition happens from connected objects to connected individuals. The block diagram for the proposed project comprises of a micro-controller, which in this case is a NodeMCU. The benefit of using the NodeMCU is that it is cheap, small and size and have built in WiFi Capability. The choice of accelerometer sensor is MPU6050 which has six degrees of freedom allowing to obtain both accelerometer and gyroscope data. 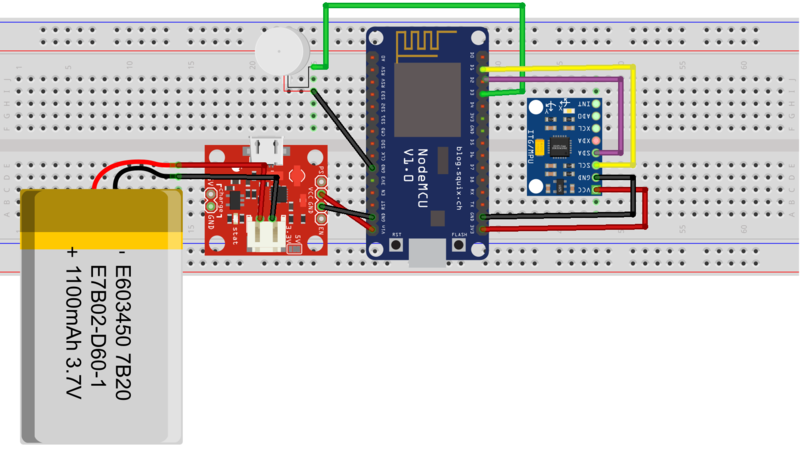 It is available cheaply and moreover it can be easily interfaced with NodeMCU through I2C. The vibration motor is used for feedback. The circuit also comprises of a battery charging circuit for the LiPo battery so that it can be used easily without the need to connect it to the system. For the cloud, Blynk is used which allows for easy interfacing as well as the desired capabilities in a neat to use app. The implementation has been divided into two parts to demonstrate the working easily. The system implementation consists of the top level functions such as the setup and the loop functions and the respective declarations and initialization. In the module implementation, each of the module has been explored to gain better understanding into the working of the entire system. The NodeMCU will be programmed using the Arduino compatible set of instructions. The two main functions are the setup function and the loop function. In the setup function, initialization takes place. The setup function is run only once at the start of the program. The comes the loop function which as the name implies goes on repeating continuously till the power is connected to the circuit. A magnetic type attachment has been made which allows for easy snapping of the hardware onto the cloth. Previously many other methods were tried such as stitching the hardware to the cloth but there were stability and debugging issues. With the magnetic attachments now in place, the connection is simple while still making the removal process as simple as possible. The prototype was successfully implemented and was confirmed to be giving accurate results with respect to the three main functions viz. sleep monitoring, posture monitoring and pedometer. The supplementary functions viz. temperature and custom alarm was verified to be working as desired too. The sketch used 26% of the program space, thus leaving space for more modules to be connected at ease. The total hardware cost was less than the price of any go to market smart band. When compared with the Mi Band 2, the outcome is almost stable where the prototype gives good competition and proper values with respect to the Mi Band 2. The prototype even performs better for sleep monitoring as the resolution of the interval for sleep monitoring is 10 seconds. The prototype has advantage over the smart band because the false count is much less in such implementation due to the very position of the sensor. Also, it provides advantage that more modules (such as in this case – posture monitoring) can be introduced. All in all, this was a successful first step towards a smarter future for the smart Individuals. The main code to run all the modules for the project. Please save it as .ino file and then load it up in the Arduino IDE.